Today marks the 2017 Winter Solstice, the darkest day of the year. 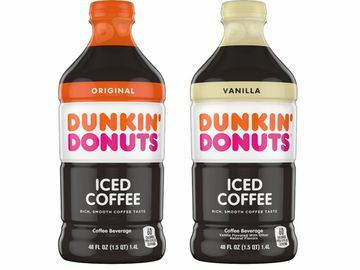 Here at Dunkin’, we are embracing the darkness with our Dunkin’ Dark Roast. 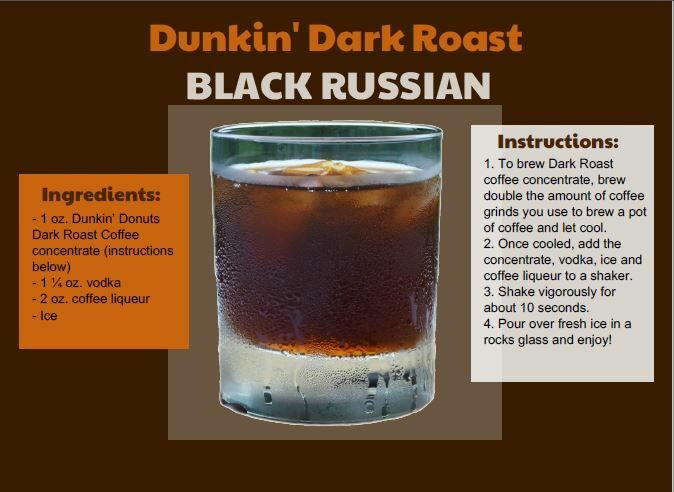 In honor of the start of winter and the darkest day of the year, the chefs of the Dunkin’ Test Kitchen have created three special Dark Roast infused recipes. 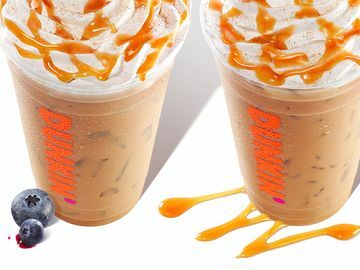 You can enjoy Dunkin’ Dark Roast layered in a chocolatey parfait, filled in Chocolate Glazed MUNCHKINS® donut hole treats or even mixed in a Dunkin’ Black Russian cocktail. Check out all three recipes below. Combine 1 cup of heavy cream and ground Dark Roast coffee beans in a small saucepan. Warm the mixture over low heat. Once the cream begins to steam, remove from heat and allow the steeped cream to cool. Once cooled, pour the cream mixture through a fine mesh strainer. Mix the chilled cream in a mixer on high speed until thoroughly whipped. Refrigerate the Dark Roast whipped cream until ready to use. Make chocolate pudding according to package instructions and set aside. 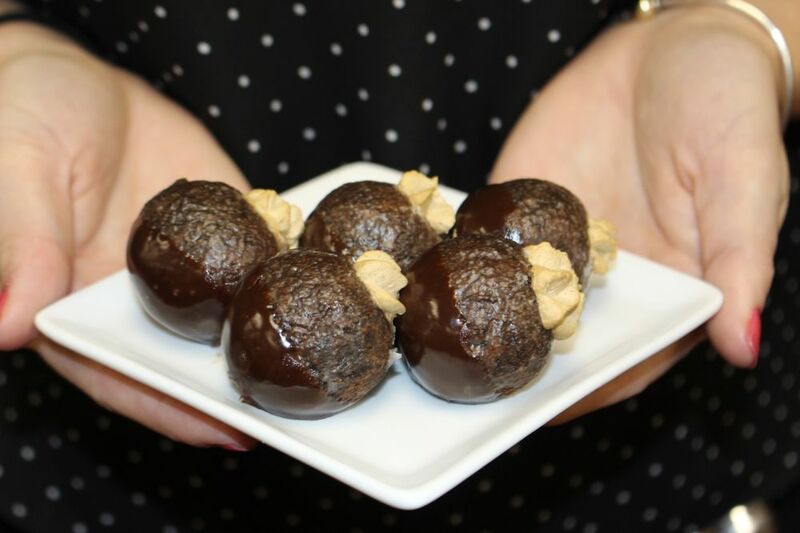 Crumble Chocolate Glazed MUNCHKINS® into small pieces and set aside. Once you have all of your components ready to go, its time to put together your parfait! 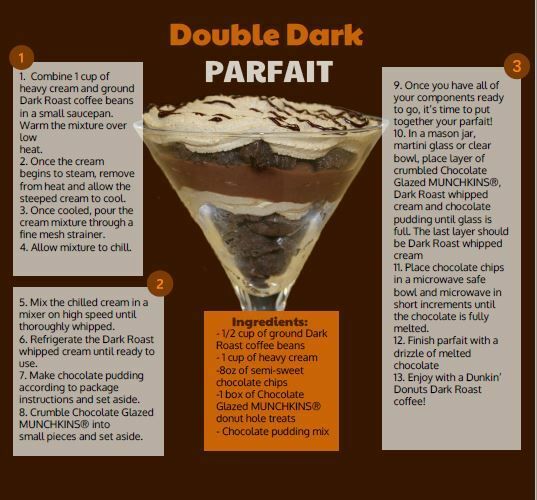 In a mason jar, martini glass or clear bowl, place layers of crumbled Chocolate Glazed MUNCHKINNS®, Dark Roast whipped cream and chocolate pudding until glass is full. he last layer should be Dark Roast whipped cream. Place chocolate chips in a microwave safe bowl and microwave in short increments untul the chocolate is fully melted. Finish parfait with a drizzle of melted chocolate. 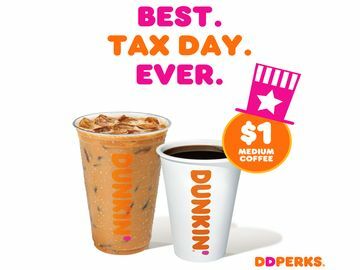 Enjoy with a Dunkin' Donuts Dark Roast coffee! Place chocolate chips in a microwave safe bowl and microwave in short increments until the chocolate is fully melted. Fill pastry bag with Dark Roast whipped cream. 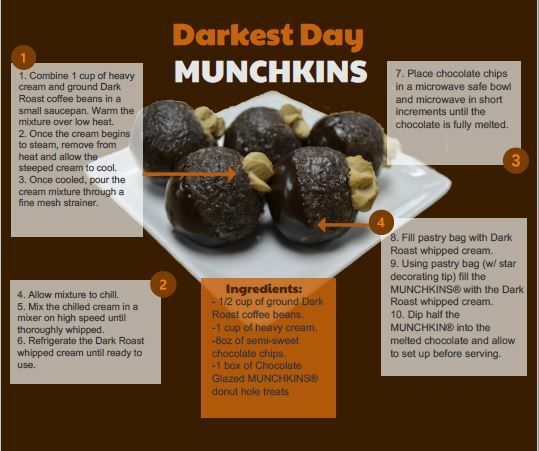 Using pastry bag (w/ star decorating tip) fill the MUNCHKINS® with the Dark Roast whipped cream. Dip half the MUNCHKINS into the melted chocolate and allow to set before serving. 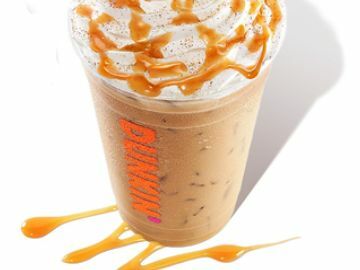 Be sure to share your Dunkin’ Dark Roast inspired creations on Facebook, Twitter and Instagram! 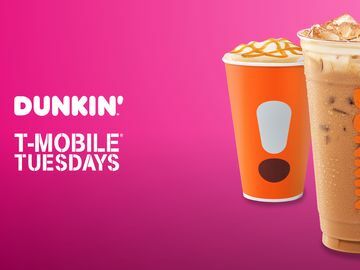 For more recipes from our Dunkin Culinary team, click here.